Bored Cricket Crazy Indians (BCC!) 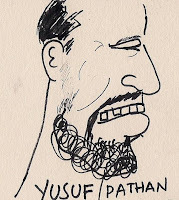 - play with cricket: Paging Yusuf Pathan because nobody’s calling him. Paging Yusuf Pathan because nobody’s calling him. Did the missing tooth do him in? You, me and cricket are doing some strange things together – when I didn’t want you in the team, you were always there. Now when I want you in, you’re out, baby. I could always tell when you were about to hold out first ball, second ball to long off or long on. You know why? Because it usually was first ball or second ball, long on or long off. It was as if the pressure of hitting the first ball for six was making your head and the bubble gum explode simultaneously – must have been a freak of a pressure equation, you poor Pathan. I was convinced you were not only a selector but also the guy who owns a cement company. The way it worked was, you were being rewarded for trying to hit a hole in one - which as per my calculations is making all the runs in one ball. Then one day, you wrote a letter to yourself – finally had enough of your shenanigans. It’s not working, gotta drop you. You returned to the domestics, and how you domesticated, nay, enslaved the bowlers, you brute of a boy. I have not forgotten the 2010 Duleep trophy finals. You returned, I was still sceptical. These were not domestics anymore. They do bowl fast and short here, you know. But you played two knocks, and took many on your body, you pulled, you plotted, you played, how you played. I remember, and so should every Indian. They were not too different from the Duleep trophy back-from-the-dead turnarounds. I do not recall watching knocks of such intensity, by an Indian batsman in the last few years (in ODIs ok?). If I recall, you were good enough for a few overs too. Then the World Cup happened, you were hurled around the order, and it was obvious – your failures would accommodate Raina. That when Raina’s form had been on the wane for a while. You didn’t make the Caribbean or England. Now when Gambhir, Sehwag, Yuvraj, Rohit, Bhajji, possibly Sachin, are all out of the one-dayers, you still don’t make it. Ravindra Jadeja, and now Manoj Tiwary got a call. You can tell us, what did you say to the doctor? Good post NC, summed it up perfectly. For players like him the team management should give him a license to play his natural game, failures(rough pathces) are bound to happen with his style of play. They should tell him - Yusuf you get to play the next 30 ODIs, no pressure, that would bring out the best in him In my opinion.